My second peak of the day, I did this one after a nice break at the Schulman Grove visitor center. Earlier on in the day, I had gotten there before the visitor center was open, and couldn’t figure out where or how to pay the parking/day-use fee. When I got back from the first hike, the visitor center was open (and had visitors!). I went in and got a fridge magnet, and chatted with the very friendly rangers that staff the center. Returning to my car in the parking lot, I ran across a man who’d locked his keys in his truck. I offered my help, though I knew not what to do. He said he planned on breaking the window after trying various other means. I didn’t stick around long enough to find out what he was going to do. I figured I’d help him somehow, upon my return. Later, it appeared he was able to get into his vehicle. It was gone, with no sign of broken glass. On with my hike to Clem Nelson Peak! As with the earlier peak, this hike can be started at the visitor center, which is what I did. Or, if you want to shave some mileage/time, you can drive up White Mountain Road a bit more, find a place to park, and approach from the west/southwest. Cross-country travel up here is not difficult, except for the very high elevation making it hard to get enough oxygen! I got on the Discovery Trail by starting to walk out of the visitor center (west). I picked up the Discovery Trail on its west entrance (it’s a 1-mile loop). It starts uphill right away. Most of this trail is built on rock. It’s strikingly beautiful, with many ancient trees along its path. 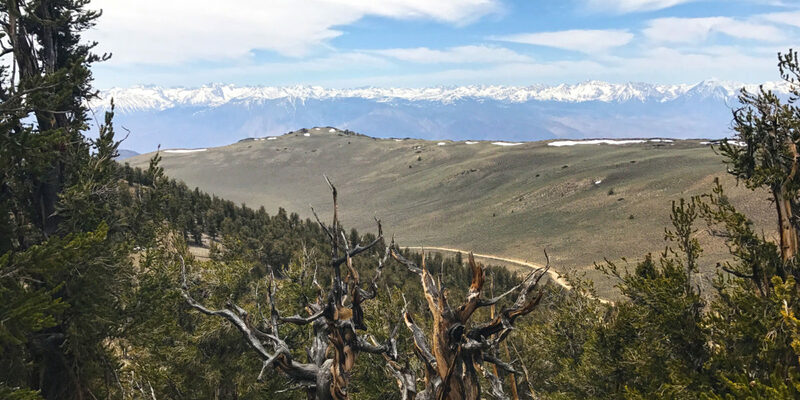 Once the trail had gotten to what seemed like its high point (and furthest north), about a half-mile in, I left the trail to head toward Clem Nelson Peak cross-country. The vegetation is quite sparse in this desert mountain range, so finding a clear path is straightforward. Along the way, one gets to see a lot of these ancient trees that, perhaps, not many people have seen. On the approach I took, there was a false summit to skirt around. I stayed on the west side of it, so as to avoid unnecessary elevation gain. It was a bit tricky in places, traversing the steep slope. It wasn’t too long before Clem Nelson Peak presented itself. The easiest way up seemed to be slightly left of the center of the summit slope facing me. To the right was considerably steeper. I took my time going up the slope. In places, there seemed to be a very faint use/animal trail. I followed that occasionally, but mostly just took my own path straight up the peak. It was a bit tough at times, due to the steepness, and more significantly, the elevation. But I took my time and got there! Arriving at the top, the ridge quickly levels off. It’s very obvious the summit has been reached. There are excellent views in all directions. Lots of ladybugs! I mean, really, thousands of them within 20 feet of me on the summit. A summit register! There’s an ammo box with a summit log in it. I pulled it out and put my name/comments in there. I also located both another SOTA activation and a Bob Burd entry. I got my SOTABeams linked dipole set up pretty easily, and sat down on a comfy rock to get some contacts. With just enough cell service, I was able to self-spot and get contacts rolling in right away. Again, I started out on 20 meters. Pretty quickly, I had 7 QSOs there. Then I switched over to 40m and got one. I was getting ready to pack up, and figured I’d give 2 meters a try, on my little 1.5-watt handie-talkie. I had Len, WA6IQO, come back to me right away — loud and clear. He was about 12 miles away, in the middle of Bishop. We chatted about SOTA a little bit, then he got to work on local repeaters, getting me some more simplex contacts on 2-meter FM. I believe the farthest was about 30 miles away. Most were nice and clear, as long as I stood tall in the middle of the summit area. By the time I got done with the VHF-FM contacts, I was getting a bit antsy to get a move on. I had been ready to pack up and get back down to camp for a while. The Grandview Campground was quite a pleasant place to stay. I also wanted to have some time to make dinner and play around with Winlink a bit to see if I could send emails from the middle of nowhere (I did!). Heading back down, I ended up doing cross-country almost all the way back to the visitor center before I found the trail again. Nonetheless, it was an enjoyable back down. All in all, a great activation. Thanks to all the chasers!